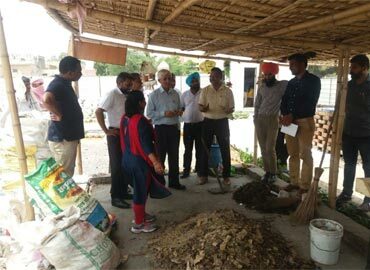 The Sanitation Park developed at Jind, Haryana, under a Pilot ‘No open waste (NOW)’ project covering 2 wards to provide end-to-end treatment of waste generated by households, commercial units and institutions has been notified as a best practice model on solid waste management (SWM). The success of the initiative has not only motivated Municipal Council, Jind to scale up the projects in other wards of the city, but other civic bodies are also showing keen interest in replicating the model in their area. On 30 th May, 2018, a team of 27 members from Punjab Municipal Infrastructure Development Company (PMIDC) visited Jind City to assess the best practices in SWM. The team comprised of PMIDC officials and community facilitators. And was led by Dr. Puran Singh, Project Director, SWM, PMIDC. The team appreciated the concept and efforts of Municipal Council, Jind and the Feedback Foundation team, and are evaluating replication of the No Open Waste concept in Punjab.